The Holy Roman Emperor, Frederick I, nicknamed Barbarossa, often was engaged in campaigns in Italy against rebellious cities such as Milan. As he began one campaign in 1158, Frederick issued a set of rules for his army to follow. Frederick’s biographer, Otto of Freising, recorded these 25 rules in his work Gesta Frederici I imperatoris. Most of the articles deal with regulating daily life while in camp, and to establish penalties for soldiers and other camp followers. 1) We have decreed and desire to have it strictly observed that no knight or sergeant shall presume to provoke strife. But if one man quarrel with another, neither shall utter the rallying cry of the camp, lest his people be incited thereby to battle. But if strife shall have started, no one shall run up with weapons (sword, spear, or arrows); but, clad in breast plate, shield, and helmet, let him bring to the fight nothing but staff with which to separate the combatants. No one shall shout the rallying cry of the camp save when seeking his quarters. But if a soldier shall cause strife by shouting out the rallying cry, all his accouterment shall be taken from him, and he shall be expelled from the army. If a servant shall have done so, he shall be shorn, flogged and branded on the cheek, or his lord shall buy him off with all his accouterment. 2) Whosoever shall have wounded anyone and deny it shall then have his hand cut off if the wounded man can convict him by two truthful witnesses, not related to him. But if witnesses are lacking and he wishes to clear himself by an oath, the accuser may, if he pleases, refuse to accept the oath and challenge him to a duel. 3) Whosoever kills anyone, and has been convicted by two truthful witnesses not related to the slain man, shall suffer death. But if witnesses are lacking, and he wishes to purge himself by an oath, a close friend of the slain man may challenge him to a duel. 4) If a strange knight shall come peacefully to the camp, riding a palfrey, without shield and weapons, if anyone injure him, he shall be judged a violator of the peace. But if he come to camp riding a charger, with a shield slung from his neck and a lance in his hand, if anyone injure him he has not broken the peace. 5) A soldier who has despoiled a merchant shall make twofold restitution for what he has taken, and swear that he did not know he was a merchant. If he be a servant, he shall be shorn and branded on the cheek, or his lord shall restore the plunder on his behalf. 6) Whosoever sees anyone robbing a church or a market ought to prevent him, yet without strife; if he cannot prevent him, he should bring accusation against the guilty man in court. 7) No one is to have a woman in his quarters; but he who dares to do so shall be deprived of all his accouterment and be considered excommunicate, and the woman’s nose shall be cut off. 8) No one shall attack a stronghold that has a garrison from the court. 9) If a servant commit theft and is detected, if he was not previously a thief he shall not be hanged for it, but shall be shorn, flogged, and branded on the cheek, and expelled from the army, unless his lord buy him with entire accouterment. If he was previously a thief, he shall be hanged. 10) If any servant be accused, but not caught in the act, of theft, on the following day he shall purge himself by the ordeal of red-hot iron, or his lord shall swear on his behalf; but the accuser shall swear that cited him for theft for no other reason than because he thought him guilty. 11) If anyone finds another’s horse, he shall not shear it or disguise it, but shall tell the marshal, and shall not secretly keep it and place his pack upon it. But if he who has lost the horse come upon it on the road carrying burden, he shall not pull off its pack but follow it to camp and recover his horse. 12) If anyone set fire to a village or a house, he shall be shorn and branded on the cheeks and flogged. 13) A smith shall not burn charcoal in a village but carry his wood to his quarters and burn it there; but if he does it in a village, he shall be shorn, flogged, and branded on the cheeks. 14) If anyone injure another, charging that he has not sworn to keep the peace, he shall not be guilty of breaking the peace unless the other can prove by two satisfactory witnesses that he did swear to keep the peace. 15) No one shall receive in his quarters a servant who is without a master. If he does so, he shall return twofold whatever the servant has carried off. 16) Whoever finds a buried treasure may enjoy it freely. But if it is taken away from him, he shall not render evil for evil, shall not exact vengeance for the wrong done him, but shall lodge a complaint with the marshal in order to secure justice. 17) If a German merchant enters a city and buys goods and conveys them to the army and sells them at a higher price to the army, the chamberlain shall take away from him his entire stock and shall flog, shear and brand him on the cheek. 18) No German is to have an Italian as a comrade unless he understands German; but if he does have such a person, all that he has shall be taken from him. 19) If a knight utters insults to a knight, he may deny it upon oath; if he does not deny it, he is to pay him a fine of ten pounds in that money current in camp at that time. 20) If anyone find vessels full of wine, let him drain off the wine so carefully that he will not break the vessels, or cut the bindings of the vessels, so that all the wine is not drained off, to the loss of the army. 21) If any fortress be taken, let the goods that are within be carried off, but do not let it be set on fire, unless the marshal commands do this. 22) If anyone hunts with dogs, he shall have the wild animal he has found and run down with the dogs, without opposition from anyone. 23) If anyone start a wild animal with greyhounds, it shall not necessarily be his, but shall belong to the one who seizes it. 24) If anyone kills a wild animal with a spear or a sword, and if someone else tries to seize it, it shall not belong to the latter, but the one who killed it shall have it without dispute. 25) If anyone while hunting kill a wild animal with a bow or crossbow, it shall be his. This peace ordinance the archbishops, bishops, and abbots ratified, offering their right hands in token, and promised that violators of the peace would be chastised by the severity of the priestly office. From Ottonis et Rahewini Gesta Frederici I imperatoris, ed. B. Simson (Hanover, 1912). A complete English translation of this work can be found in The Deeds of Frederick Barbarossa, trans. Charles C. Mierow (New York, 1953). 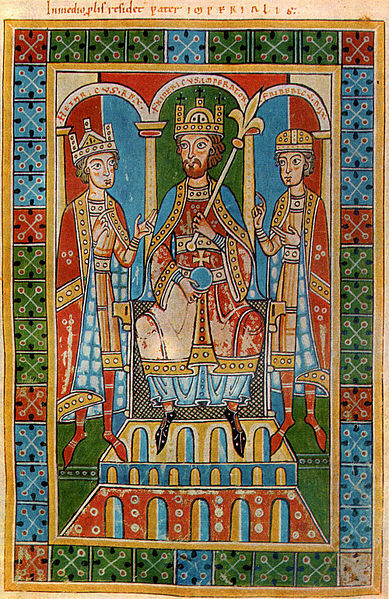 This entry was posted in Primary Sources and tagged 12C, Frederick I, Germany. Bookmark the permalink.